The Saniaccess3 has quickly become a favorite of ours. We recommend it often to customers who want great performance while working within a budget. 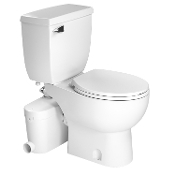 This pump can manage a full bath including the toilet, sink and a shower or bath. With its powerful refined .5hp motor it is capable of pumping up to 15ft vertically and 150ft horizontally through a 3/4 inch discharge pipe. The easy access panels set this pump apart from others as it allows access to all the major components without disconnecting the pump. Discharge Pipe Diameter (in) 3/4"